Wow. 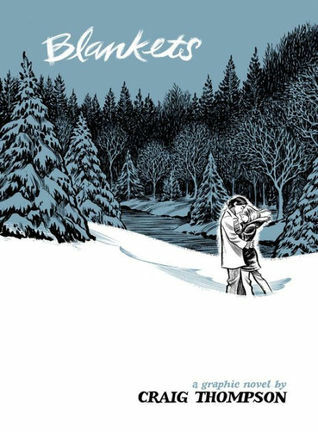 Every bit as earthshaking and meaningful as Marjane Satrapi’s Persepolis, this graphic novel by Craig Thompson published in 2003 by Top Shelf is one thoughtful Americans do not want to miss. Christian evangelical notions of life on earth and what comes after are a huge part of the narrative of our nation. Even today when our population is more diverse than ever, the history of these core beliefs within our citizenry continue to affect the direction of our politics. Teenagers instilled with these notions rarely have the intellectual wherewithal to question those received ideas. Paradoxically, perhaps because of those early teachings and the constraints of his upbringing, the author--the main character in this memoir--has the discipline and strength to look squarely at his life, the beliefs of his parents, and think again. This graphic novel won two Eisner Awards, three Harvey Awards, and two Ignatz Awards in 2004 and a Prix de la critique for the French edition a year later. A strict Christian evangelical family raises two sons in rural Wisconsin; we watch the boys grow up from sleeping together in the same room/same bed they move to their own rooms, go to summer camp, get harassed at school, romance a girl. 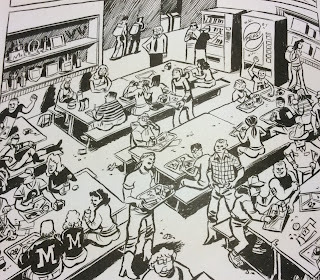 Sometimes graphic novels get a few things right, like the artwork, or the pacing. In this case, Thompson seemed to get everything right. The growing up story is poignant and real and revealing about farm life in Wisconsin in a close-knit religious family. Craig goes to visit his girlfriend Raina who lives in the snowiest city in the contiguous United States, in the Upper Peninsula of far north Michigan....in winter. We are treated to Raina's home life as well, another Christian family who struggles under enormous pressures. Graphic novels are especially impressive because they must portray characters from an endless array of angles, and in this case, we recognize a character as he grows over a period of years. Moreover, we are feeling that character struggle with the promises and constraints of his religion and the actual manifestation of those teachings that he can see. When Craig’s pastor suggests he consider a religious calling, Craig seriously contemplates the idea. The graphic novel drops into lower gear here and we see the quality of the intellect behind the work. Craig’s thinking and research into the Bible is Jesuitical, deep and challenging, and he is left with too many unanswered questions and lingering doubts. Different mentorship probably would have produced a different result. This portion of the book is careful, allowing Craig to slip away, leaving the door to his family open, and conflict at bay. Thompson’s drawing skill is exceptional and smart, unmistakably capturing movement from life. The group scenes are especially exciting; for example, he might draw a high school cafeteria with many tables of students doing all manner of shenanigans. It is Bruegel, in ink. Thompson didn’t hold back on this book: it is 582 pages, not including the credits. He took the time to draw out his religious questioning and didn’t rush us through his moments of insight and revelation. I especially appreciated the belly laughs he led us to near the end of the memoir when some of the church elders in his hometown warned Craig not to consider going to art school, lest it lead him to sin. Our hearts nearly break with what the teen will miss if he doesn’t follow his passion, but again he manages to avoid confrontation while following his dreams. Thompson has continued his remarkable success, and in 2011 Pantheon Books published Habibi, a book Thompson had begun working on in 2004 after traveling in Europe for a time. Influenced by Arabic calligraphy and Islamic mythology, Thompson tells us "I'm playing with Islam in the same way I was playing with Christianity in Blankets.” [Wiki]. Below I have posted two videos of Thompson demonstrating and discussing his work. The first is short and covers his childhood and all books. The second is a 56 minute interview, with slides, of Thompson discussing Habibi. This man completely knocks me out; I am wowed by his work, and the depth and scope of his intellect. Highly recommended.